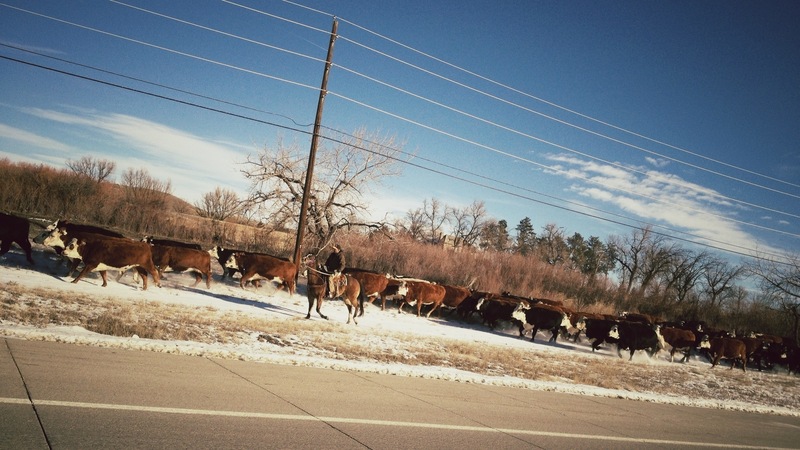 Herding cattle as part of our move? Heading from old Spidertrax to new Spidertrax, I’m abruptly stopped in the middle of Highway 66 for reasons unknown. Figuring something must be up, I waited with my co-driver Marcus to see what, if anything, would turn up. Sure enough, a heard of cattle crosses in front of us, and proceeds to trot down the road. One of the many unique elements surrounding old Spidertrax that will be missed. The 80+ minute total daily commute, on the other hand, is not one of them. 30 Dec	This entry was published on December 30, 2012 at 3:31 pm and is filed under Spidertrax. Bookmark the permalink. Follow any comments here with the RSS feed for this post. Newer: And the new year begins.